A taco cheeseburger is a cheeseburger mixed with a taco. 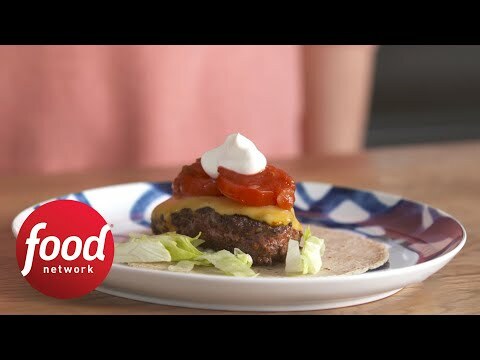 Taco cheeseburger, kids can make it too. As we’re going to be making our lunch, I want us to be playing a little game talking about the food groups. The food groups is dairy, fruit, protein, grain, and vegetables. So I’m going to have you mix together some spices. So that’s some chili powder. – All of it? – All of it. Some cumin. Cumin. Here’s some salt. Can you whisk that all together? Mm-hmm. Perfect. That looks great. So here’s our beef. Can you tell me which food group does this belong to? Not vegetables, not fruit. Protein? Yeah, you got it. So now we’re going to take our protein and we’re going to make it into burgers. So I’m going to form this into some patties. Patties? Yeah. We sprinkle seasoning so that it tastes great. Hold it up high. Twirl your fingers like that and move it around. There you go. Now we need to flip these over. We want both sides taste good. And then you cut it in half. Give it a little wiggle. Great. We’re going to actually turn these into cheeseburgers. Can you tell me what food group does cheese go into? Go find your card. Dairy? Yeah, you got it. And then fold the cheese and rip the cheese in half. So now we need to put a little bit of oil in our pan so that our meat doesn’t stick. So now we’re letting our burgers cook. Now we’re going to start flipping our burger halves. Then you put the cheese on the burger. Perfect. Here, this one goes here. And that cheese is going to get– Melty. –nice and melty, right. OK, these look done to me. Oh, yummy. Put tin foil, and you let steam come out, but the heat stays in. Now it’s time to build our tacos. So we need some tortillas, right. Can you tell me which food group do tortillas belong to? Grain! Yeah, you got it. Let’s make our base a little bit of lettuce. Now we need our burger patties. Which one do you want? – This one. This one, the big one? Are you hungry? And then you add tomatoes, salsa, and I’m putting some sour cream on it. I know it tastes great. You can fold this over, make our tacos. I think it’s going to taste really good, right? I’m the best taco cheeseburger chef in the world.